This guide will demonstrate how to setup the impCentral to deploy an IoT solution using your imp Kits. Electric Imp is an IoT Security Platform whose partnership with Ubidots cannot be overlooked. The impCloud equips every one of the devices you ship with its own unique ‘agent’: a fully programmable cloud-hosted micro-server dedicated to supporting and enhancing your product with powerful communications, computing and security capabilities. Because of this 1:1 relationship, the software you build in the agent only needs to deal with one device; scaling is effortless and automatic. In this guide you’ll learn how setup the ImpCentral to start deploying your IoT scalable applications with Ubidots Cloud. 2. Handling data with Ubidots Cloud. The best way to become familiar with the Electric Imp Environment (Hardware & Software) is by following their getting started guide. 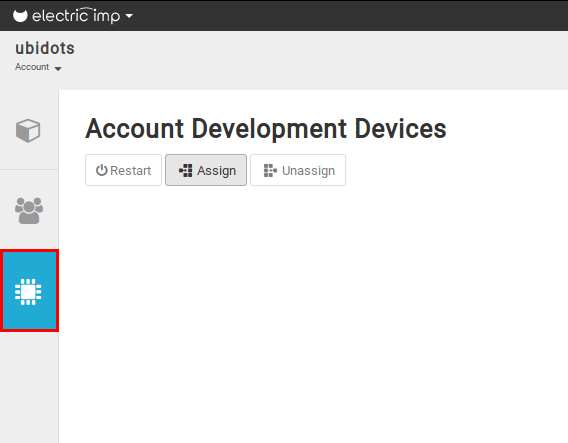 Anyway below you will find the started steps to deploy your first application using Electric Imp and Ubidots Cloud. To start, create a Free Electric Imp Account. Then, sign in into the account created. 1. To be able to program the any imp kit, you need to add it to your Electric Imp account. Electric imp called to this process "Activation", where everything is done and a connected in just a couple of minutes thanks to the Electric Imp's BlinkUp™ technology. IMPORTANT NOTE: At this point to be able to activate the imp Kit, please power it by connecting the USB cable to your computer or any power adapter. 3. The following window is the one in charge to connect the imp Kit used to the network desired. Assign the Wi-Fi Network Name (SSID) and Wi-Fi Network Password to establish the connection with the device. To finish, press "Start BlinkUp"
4. At this point the window below will appear. Here you have to locate the front part of the imp Kit in the screen of your computer to establish the connection. 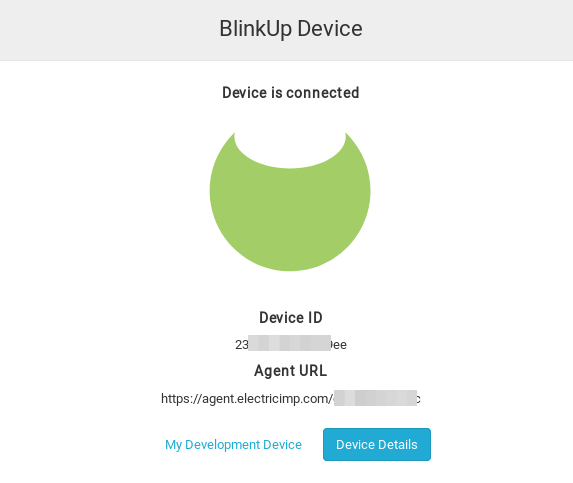 Now you Imp Kit is already activated with your Electric Imp account, also is connected to the network assigned in the activation process. IMPORTANT NOTE: To get a better understanding of how the impCentral works for scalable deployments, refer to the step "Programming Your imp Kit" of the following guide. 2. Then, in the next window assign name desired as product's name. 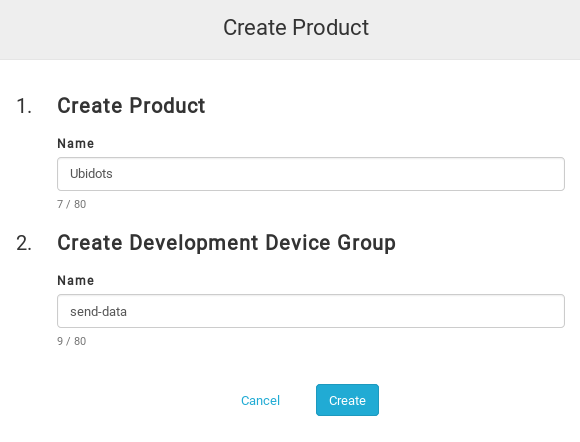 Also, you need to assign the name of the Development Device Group to create it. How Device Group works? Well, all devices that are assigned to a given Device Group run the same code. This feature is really helpful when you desired to deploy multiples devices at the same time. How Device Group works? Well, all devices that are assigned to a given Device Group run the same code. This feature is really helpful when you desired to deploy multiple devices at the same time. 7. 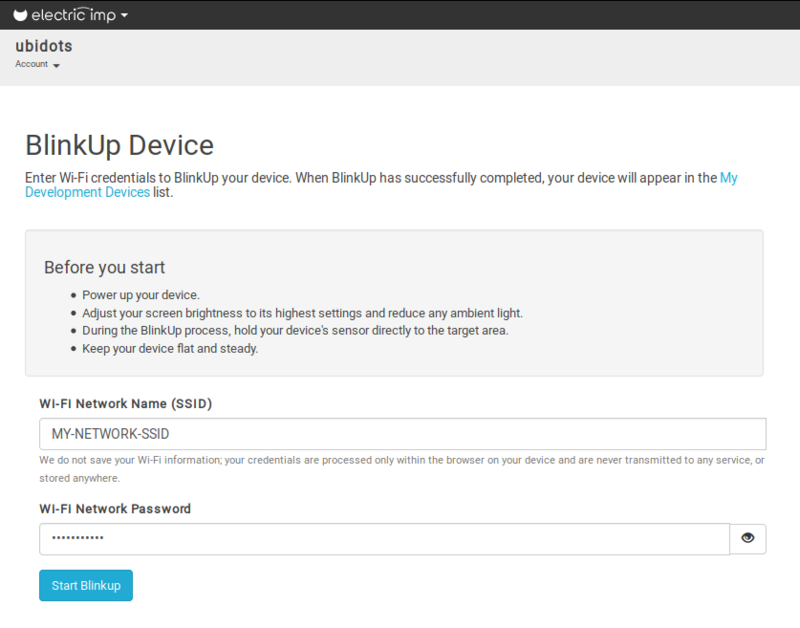 At this point, everything is configured to start programming our imp Kit to transmit data to Ubidots Cloud. Before start programming the board let's review the impCentral workflow. Agent Code: This run in the imp cloud, not in the device. Agents run continually, allowing devices to be accessible even if they are sleeping to conserve power. The agent can check the device’s state and hold any received data until the device is awake again. Device Code: This code will run in your device. Here's where you typically manage inputs/outputs pins that connect the imp Kit to the real world. Log Window: Provide you the logs in real time of the behavior presented in the imp kit used. For a detailed explanation of the impCentral, visit the Electric Imp documentation page. If you desire to review the library or get the sample codes directly from the repository, just click here. Thanks to the features provided by Electric Imp, you can deploy your IoT solution in a scalable way just by clicking a couple of clicks. Now its time to create Ubidots Dashboards to visualize your data and deploy your IoT solution!